Established in 1895 in Pickering, North Yorkshire, we have been a family run business for over 5 generations. Over the years we have continued the traditions of our original Ironmongers store, providing our customers with a personal and professional service. We supply thousands of product lines covering all aspects of the home and garden, including homewares, furniture, hardware and decorating supplies. We have a dedicated kitchen and bathroom design and installation service supplying customers for over 30 years. Our designers have a wealth of knowledge and experience. Visit our in store showroom to look at the latest ranges and pick up a brochure. Whatever your needs you are sure to find inspiration in store. We have an ever expanding range of solid oak and pine furniture, soft furnishings and homewares to compliment every room of the house. There is a Dulux paint mixing machine in store and a key and glass cutting service. We also have carpet cleaners and wallpaper steamers available to hire and stock Calor Gas cylinders available in a variety of sizes. We are always introducing new suppliers in store and if we don’t stock it, chances are we can quickly get it. 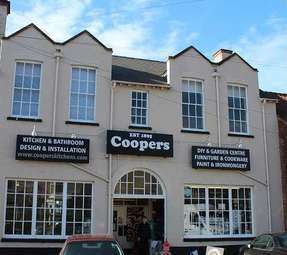 Coopers is situated in the centre of town with a large free customer car park. Whether you need advice or inspiration, we look forward to helping you with your future home projects.